It’s that time of year again, when scholars and students of Jewish Studies from around the United States and the world gather to learn about each others’ research, to develop friendships and discuss shared projects, and (we hope) to chit chat in person about all the exciting material they’ve been reading on In geveb. 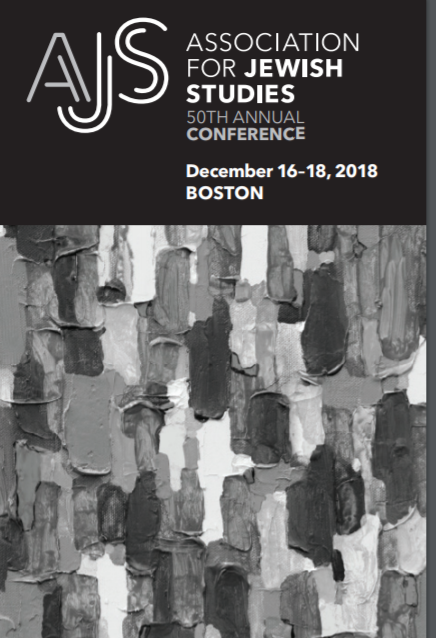 The Annual Conference of the Association for Jewish Studies (AJS) will be held in Boston this year on December 16-18. 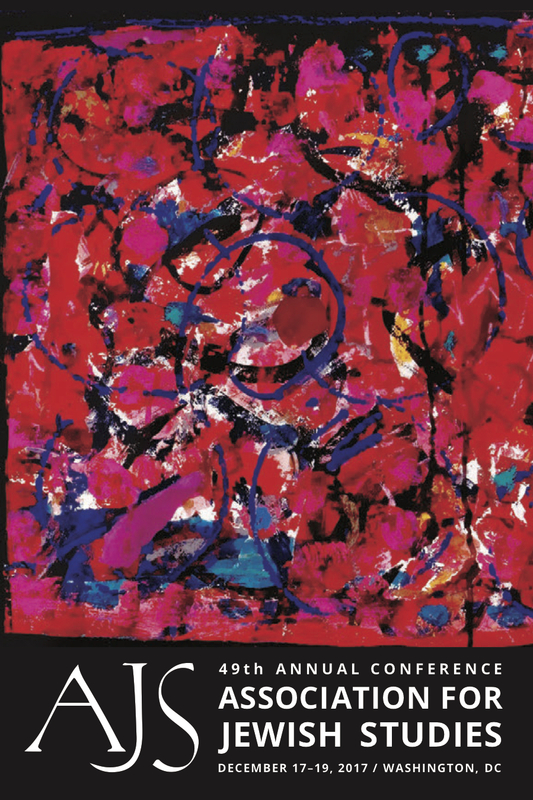 In geveb was launched at the AJS conference in 2013, and we’ve been an enthusiastic presence at the conference ever since. That means that while it’s the 50th anniversary of the AJS conference, it’s also an important anniversary for us - we’ve been around for five whole, and very full, years! We look forward to celebrating both milestones with our friends at the AJS conference. For the past four years we have organized a roundtable each year approaching the question of “the state of Yiddish Studies” from different angles. 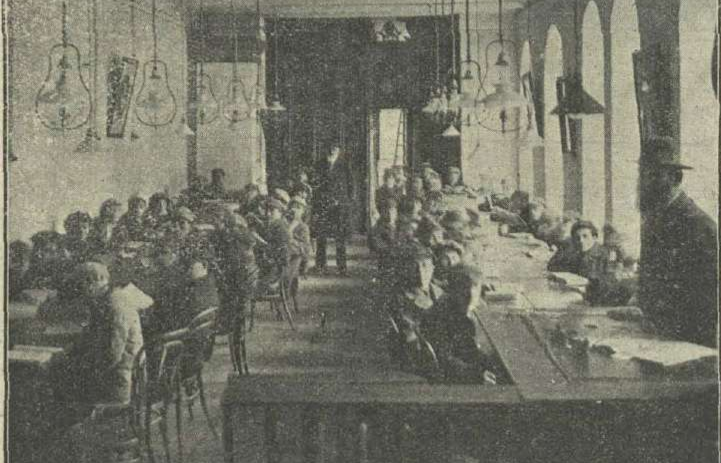 These roundtables have resulted in several series of essays, including on the state of Yiddish translation and teaching Yiddish in the digital age. We are continuing the tradition this year with a roundtable on “Teaching in Translation, Teaching as Translation” (see link below). We hope you will join us for the discussion. Our round table is only one of many papers and panels related to Yiddish that will be taking place, and we’re pleased to offer, for the second year in a row, our guide to Yiddish at the conference (if you notice something we’re missing, please email us!) We’d like to acknowledge Gahl Rinat for his work in compiling this list. We hope that you will discover, as we have, that our field is varied and fresh, full of new ideas and enriched by scholars working in a variety of positions and disciplinary backgrounds. If you are one of the presenters included here, we hope you will consider submitting your work to In geveb for publication! This year we are particularly proud and grateful to be participating in the annual meeting of an organization that is committed to upholding its core ethical values. In light of a labor management dispute between the Marriott Corporation and the UNITE HERE labor organization, resulting in strikes at several Marriott hotels around the country, the AJS canceled its contract with the Marriott Sheraton in Boston for its conference and relocated to the Seaport Hotel. We’re looking forward to seeing our Yiddish studies friends and colleagues at this new location, and sharing with them a respect for the many kinds of labor that go into our conferences, including the labor of hotel workers. Teaching in Translation, Teaching as Translation Roundtable: (Sunday 10-11:30am, Seaport Hotel & World Trade Center, Federal 2 Complex): Our roundtable this year brings together instructors who teach with texts, both literary and historical, written originally in languages other than the language of instruction. Addressing the methodologies and philosophies of teaching in translation, and teaching as an act of translation, participants will discuss pragmatic strategies for teaching texts in translation, as well as mechanisms for conveying contextual elements that require additional translation from the teacher’s knowledge to students’ frames of reference. In geveb “Office Hours”: In geveb editors will be holding “office hours” at the Seaport Cafe on Monday 8:00-10:00 and Tuesday 10:00-12:00. Come and talk to us about your pitches, ideas for articles you’d like to talk through, or just to chat about what you’ve read on In geveb or the field of Yiddish Studies more generally. Say hello! : In geveb editors and editorial board members will be wearing pins with our logo during the conference. If you see someone wearing an In geveb pin please introduce yourself! On Twitter: As in past years, In geveb will be live tweeting the conference. Follow us at @ingeveb to get a glimpse of the Yiddish Studies learning we’re experiencing, even if you can’t make it to the conference. 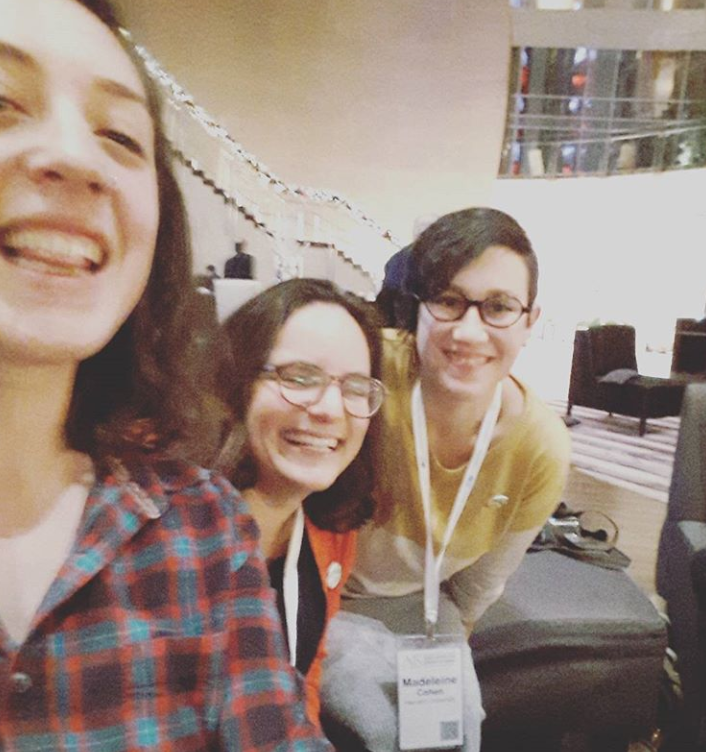 Diana Clarke (Managing Editor for the Blog), Jessica Kirzane (Editor-in-Chief) and Madeleine Cohen (Senior Editor) enjoying the AJS conference together this past December. Follow us on Instagram (@in.geveb) for more editorial selfies. Editors, The . “Your Guide to Yiddish and In geveb at the 2018 AJS Conference.” In geveb, December 2018: https://ingeveb.org/blog/your-guide-to-yiddish-and-in-geveb-at-the-2018-ajs-conference. Editors, The . “Your Guide to Yiddish and In geveb at the 2018 AJS Conference.” In geveb (December 2018): Accessed Apr 21, 2019.